Something very unique has happened in Arkansas! 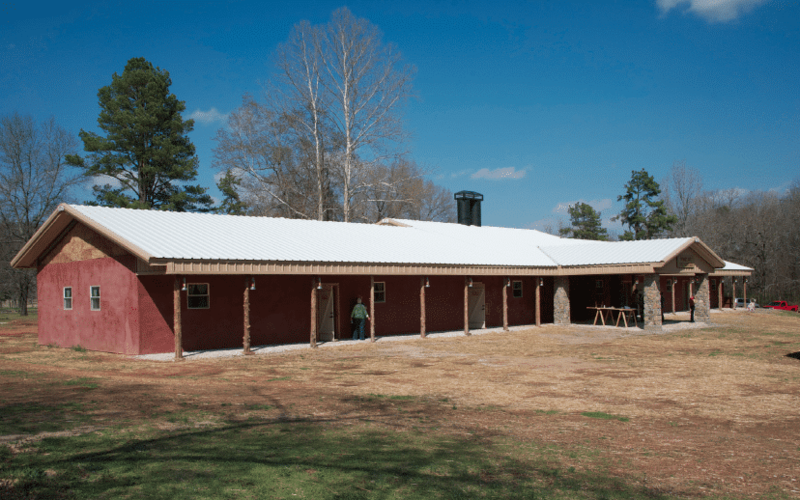 The Eco Center at Ferncliff in Little Rock is a volunteer-built straw bale mecca for those looking for sustainable building options. The floors alone are worthy of an article to themselves! First, a bit of background. Ferncliff is a summer camp and conference center owned by a nearby Presbyterian church. The center built the eco building to provide a place where children and adults could learn about sustainable building and living. It features a solar school, a lodge for adults, and a summer camp for kids to learn about caring for the environment. 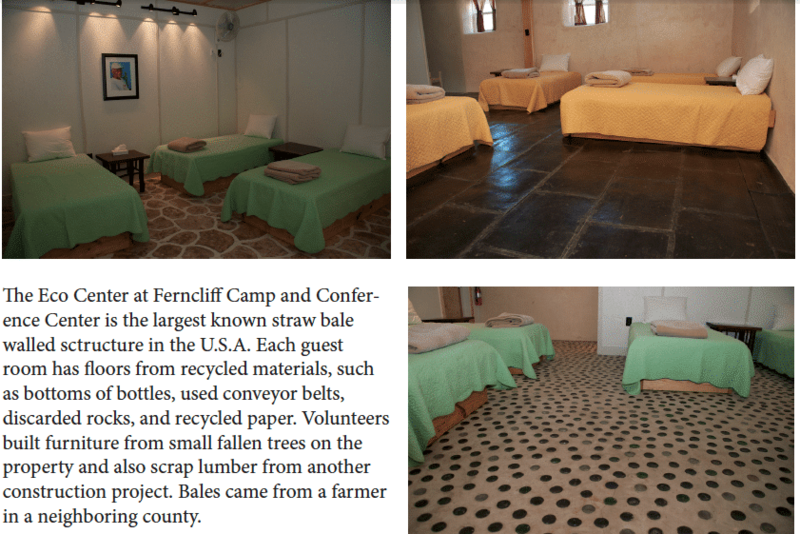 It is believed to be the largest straw bale building on earth! No, it’s not a typo. One of the guest rooms, aptly called the “Beer Bottle room,” uses thousands of empty beer bottles to create a flooring surface. The bottles were set upside down in about 4″ of sand, then 3-4″ of grout was poured on top of the sand, suspending the bottles and providing a smooth surface. The empty bottles came from worthy volunteers who drank for a cause, as well as a couple of local restaurants and bars. Some brave souls even went to the local recycling center to scavenge for more. Volunteers built a giant paper mache mill to create the next unique flooring option. Used newspaper, glue, and wheat paste are mixed with color and shaped to create this stone-look surface. The “grout” holding the fake stones together is also paper mache. The paper mache is sealed with a water-based polyurethane. The room is called the “S’mores room” due to the colors resembling graham crackers, chocolate, and marshmallows. In another room, called the “Rubber room,” used conveyor belts from a local quarry and a paper mill were ground up and compacted into tiles. The tiles were then laid over compacted gravel. Rocks that used to form the side of the pool have been repurposed into a cool new use. Stepping stones made by students affected by a school shooting who came to the camp over several years for healing.